Synopsis: A Ms. Manners guide for business executives offering rules of conduct in every situation from a job interview to a case of sexual harassment. Pincus leaves no rock unturned, including suggestions for proper dress, telephone etiquette, entertaining, and dealing with international associates. On a more esoteric level, she outlines how to read body language and how to courteously shoot down tactless behavior by colleagues. Annotation c. by Book News, Inc., Portland, Or. About the Author&colon; Marilyn Pincus has written for all the major publishers of business information. Based in Chandler, Arizona, she owns and operates Marilyn Pincus, Inc. She writes policies, procedures and similar specialty material for corporate clients and foundations and ghostwrites nonfiction trade books for others. Her books spotlighting business success skills have been published in eight languages and are read by people in many countries. She designs and presents customized Workshops/Talkshops for clients. 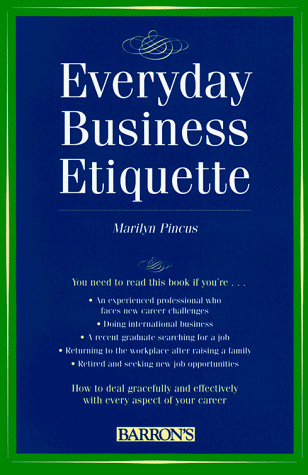 Everyday Business Etiquette is a popular topic.